York Peppermint Patty is one of the best treats around, mint + chocolate= mmm, MM! The Peter Paul Co. was gobbled up by Hershey and these are now produced by them. One of my all time favorite treats in the 80’s was the York Peppermint ice cream sticks which have since been discontinued. I don’t know much about Haviland except that they were gobbled by NECCO and I believe NECCO has since been gobbled by someone else. I’m telling you, I can’t keep up with all the buyouts in the food industry, but it’s been disturbing to me the more I discover. This has a nice firm center that makes a pretty clean break wether breaking in half or biting into. The peppermint center is just sweet enough to compliment the cool peppermint. The balanced coating of dark chocolate adds a little sophistication and decadence. I like to eat these by taking a little bite and kind of swishing it around in my mouth to disintegrate it and let the flavors merge. Ethan is more straightforward and just bites into it and chews like a normal person. Breaking these in half we were greeted with a bright pink center which had the same consistency as York’s. The chocolate on this seemed to be of a lesser quality and I guess was kind of dark but it was like a mix between milk and dark. There was not a lot of chocolate flavor in the coating. The center was not favorable at all, wintergreen does not seem to work well at all. We summed this up as tasting like chocolate covered toothpaste. We really tried to not let our familiarity with Peppermint Patty influence this evaluation and maybe it did but when I bought the Wintergreen Patty I was thinking “Would this be passable if I wanted a Peppermint Patty?” It’s still chocolate and mint right? But we really think this kind of mint and this kind of chocolate do not produce the same winning combination. I’m curious if anyone had known wintergreen first and felt the same way about peppermint. Any wintergreen fans out there? i’m rather disturbed by the pink center. I introduced my daughter to Junior Mints just this past weekend. While we were eating, I waxed nostalgic about Peppermint Patties. I’ve never tried Wintergreen Patties, never even knew it existed before now, but they sound nasty. Wintergreen would be best saved for Lifesavers and chewing gum. 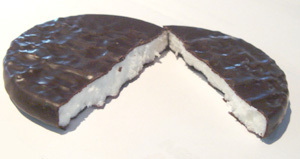 Klondike bars come in a York Peppermint Patty variety….just thought you might like to know. And they are delicious! Oh yeah I forgot about the Klondike Bars, those are very good! stash some york peppermint patties in the freezer. it makes the minty taste really pop. not quite an ice cream bar, but very good. Pound for pound, I’ll take Junior Mints over Peppermint Patties any day. Higher quality chocolate, higher chocolate-to-mint ratio and a closer-to-liquid texture inside. MMMMM. Peppermint Patties are my absolute favorite! I’ve never had a wintergreen one, but even looking at that makes me disgusted. Who came up with a pink colored mint cream? Weirdos. Junior Mints are delicious as well, but I wouldn’t compare the two because they are VERY different in most aspects. Liquidy center compared to chewy center; dark chocolate compared to a more natural cocoa flavored chocolate. It just wouldn’t be a fair contrast. Wintergreen is not a mint. It is a small evergreen shrub with pink berries (called tea berries in places where the plant is plentiful. that is to say, Pennsylvania). Wintergreen oil is either derived from the leaves of the wintergreen shrub or from white birch. Common products to include wintergreen are: gum, toothpaste, birch beer, root beer, pepto-bismol, and topical analgesics. The Haviland patties are inferior quality. We buy boutique dark chocolate wintergreen patties from the Village Sweet Shop in Collinsville, CT. She’s not the manufacturer, but she sells the best she can find (at $16/lb, I should hope so!). They beat peppermint, easily. Not that I’ll refuse Junior Mints ;). Someone else used to make Wintergreen Patties back in the 60’s, and back then, they were one of my favorite candies. Imagine my surprise when, years later, I took my first slurp of Pepto-Bismol. Loved the old wintergreen patties by York. They had the smooth filling of the peppermint and a delightful flavor with the same rich, dark chocolate coating. Tried the Haviland ones a few years ago in an attempt to recapture the flavor of the old York wintergreen, but the Havilands had a texture, flavor and coating that was nothing like the York and very unpleasant! I think back in the late 60s and early 70s I used to buy Schrafft’s Wintergreen patties. They were far superior to Haviland. There were also some homemade ones sold by a little shop in Naples, NY. Have no recollection of the name. Years ago, I much preferred York’s wintergreen patties and have often searched for them wherever I saw their peppermint patties. Sounds as if I would be disappointed by the Haviland version, though. Teaberries were called checkerberries in Maine. I grew up on Schrafft’s wintergreen patties; l have no way of knowing if they were as good as l remember them. The Haviland patties were disappointing. I have made wintergreen and peppermint patties for years, and the wintergreen wins hands down every time. Someone mentioned being disturbed by the color…I do use a very small amount of red food coloring and the candy centers are a delicate pink…not at all disturbing to my family and friends. I think you might find that wintergreen is a New England thing. I much prefer wintergreen since I grew up with them. They are hard to find now, like many of the classic Necco products; Skybar is another one. I remember Wintergreen Patties with great fondness when I was growing up (born in 1942 in upstate New York…my VERY favorite sweet treat!). I have not found any since I left to join the military in the early 60″s. Oh how I miss them! On a whim I decided to google and see what came up. Seems they might be out there someplace and I will keep trying to find them! When I do they will make my life worth living! 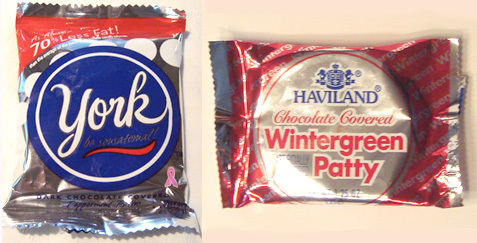 I too used to crave York peppermint patties (cost $0.05). Then I discovered said Schrafft’s wintergreen patties and I was converted. I convinced local corner store to stock them, they were called Deran’s wintergreen patties then. I believe that was the original name of what is now called Haviland patties. My mouth is watering for hit right now! My husband absolutely loves wintergreen patties. The only place that we know of that has them is a tiny corner grocery in the area and lately they haven’t had them so I have been on line to try to find some. They are very hard to find. I myself am just as happy to have York’s peppermint patties, or Junior Mints. No accounting for taste! If you never had a York Wintergreen Patty in the 60’s you don’t know what you are missing! I don’t understand why York doesn’t start producing that amazing pink patty covered in dark chocolate like they used to. If anyone knows where I can buy some with the equivalent taste please post it on here. Not Haviland ! ( would not waste my money) Thank You in advance!